Knife Sharpening Services – Should you use one? 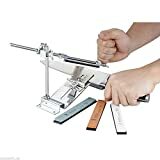 Here at sharpen-up, we have provided a vast number of reviews on knife sharpening tools, so that you can take care of your knives in the home, out in the field or in the work place. However, what if you wish to utilise the many knife-sharpening services available. Does this give the better option? The fact is, you can opt for sending your knives off for professional sharpening and you know you are going to get your knives back in tip top condition and razor sharp to boot. Some manufactures even offer factory grade sharpening on knives bought from their own product lines. Lifetime sharpness guarantees basically – you need never buy a sharpener or new chef’s knife again. However, do you really want to send your knives off a couple of times a year for sharpening? And what about honing your knives? Ideally this should be carried out after every use. Professional knife sharpening services will need to be used quite often if you are not in a position to hone your knives yourself. Good tools do not last long with the relevant tlc. 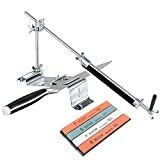 So let’s assume you are reading this because you are interested in using a local professional knife sharpener – what exactly should you look out for, and how much will be expected to pay? Let’s dive in and find out…. Professional knife sharpeners will be able to sharpen any type of knife. This is a major benefit over using an electric sharpener in the home, as very few are equipped to tackle all the blades you may have. Furthermore a reputable knife sharpener will ensure that your knives have a high-quality edge that will last you a lot longer than anything you will be able to achieve yourself. It takes these professionals many years to acquire the skill to sharpen any knife put before them. Some people like to use a knife sharpening service if they have valuable tools that they want to make sure proper care is taken of. Furthermore, tools such as the gut hook knife can be quite tricky to sharpen. It is possible to use a circular ceramic sharpener to get into the curve of the hook, however professional services are a preferred method for those that remain unsure. It is important to ask what method the sharpener will use when seeking out their services. A reputable professional sharpener should have no issue with explaining their process. Many professionals use machines to carry out the sharpening process. This might be a high-speed sander with fine grit belts. This method will remove the least amount of metal from your blade. Many professional sharpeners will also carry out the service using a multi-step process. In practice this is exactly as it sounds, they may first use a machine to get the knife sharpened, and then will go through many forms of honing and finishing so that your knife is as sharp as it was the day it left the production line. In short the person’s craftsmanship and expertise remain key factors to the end result of the knife sharping. Sharpening Services – Any Risks Involved? If you do not research the validity of the claim ‘professional knife sharpening services’ and you end up with using someone that is less than professional – your knives and wallet will suffer. Second-rate services may result in grinding a blade down too far, uneven grinding, not grinding sharp enough, and grinding the blade too hot creating bur marks that are almost possible to remove. Bad sharpening technique can weaken the blade permanently damage the steel so that it will never stay sharp. If you have spent good money on quality knives, it would be a big mistake to allow a less than reputable knife sharpening service restore your edges. Not only will you end up paying for lackluster sharpening performance, you may even end up paying out for new knives. Of course, if you are using a professional with great credentials – you know the service will be good. A professional sharpener knows what to look for – they will look to see whether or not a blade has sway. Swayed edges are common with kitchen knives, and is found were the blade is worn in different places along its length. Any sharpening will need to accommodate this. Your knives may also have problems on the bolster. Again a professional knife sharpener will know what to look for. The bolster is the thick steel between the handle and the knife blade. It helps improve control and balance while the knife is being operated. These are things that you may not be aware of and may miss when sharpening your own knife. So should you use a professional knife sharpening service? The answer to this may annoy as it really does depend. If you have invested in top quality knives, it does make sense to use a knife sharpening service every now and then. However, at the same time, you should also have a good quality sharpening and most definitely honing abilities at home. 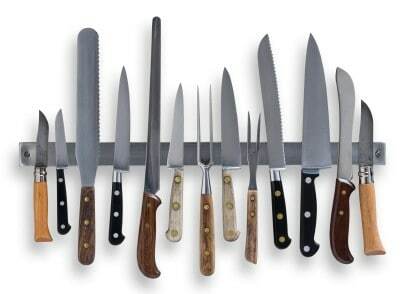 The best way to really take care of your knives is to utilize a bit of both. Keep your blades in top condition through home sharpening, and then once or twice a year, seek the services of a professional sharpener to ensure that your tools are working the best that they can. Although professional knife sharpening services will be more costly the DIY approach, as you will not be expected to do it that often, you should be able to budget this in. As with any professional service, you are paying for someone’s time and expertise. A quality sharpening service will be worth it, and you will certainly enjoy the results. Furthermore, many such services of are set up to be as convenient as possible, offering fast turn around services via the mail, or even drop in services if you live locally to one. Overall, if you want to take ultimate care of your knives utilizing the services of a professional sharpener once in a while is a good thing to do.